The U.S. Olympic Training Site at Northern Michigan University will celebrate 15 years of Greco-Roman wrestling with a competition pitting its wrestlers against the All-Navy team. The public is invited to attend this free event at 7 p.m. Thursday, March 12, in the Superior Dome. A social will follow the matches in the NMU-OTS wrestling facility nearby. Michigan native Steve Fraser, the first U.S. Olympic gold medalist in the sport and National Wrestling Hall of Fame member, will open the event with welcoming remarks. He is credited with helping to establish the Greco-Roman Olympic training program at NMU and was one of the athletes brought in for the opening celebration. Fraser was a gold medalist at the 1984 Summer Olympics in Los Angeles and was inducted into the National Wrestling Hall of Fame a decade later. 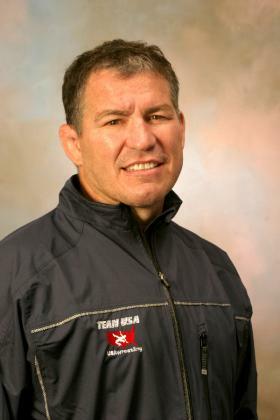 He served as USA Wrestling’s National Greco-Roman coach for more than 18 years and now, as USA Wrestling's chief of donor and alumni relations, heads fundraising efforts to increase opportunities for U.S. athletes in all three styles of wrestling. Bobbi Ullman of the U.S. Olympic Committee will also attend the event as part of her site visit to the NMU-OTS. She is associate director of training sites and community partnerships. The meet will feature 10 matches between NMU-OTS wrestlers led by head coach Rob Hermann and All-Navy team members. For more information, contact Mike Kaurala at 227-2893.